It goes without saying that this post is going to have some spoilers, y’all. I mean, it’s about a major character biting the big one on Arrow. I know that doesn’t mean something in Season 4 Arrow, but back in my day, in Season 2 Arrow, death meant something. I think this death is supposed to remind us of Season 2 Arrow but really it just–okay, I’m getting away from myself here. Spoilers. OH MY GOD IT’S ABOUT DAMN TIME. I’ve been making references to this damn grave in Arrow all over the place for the past six months and then, out of nowhere, I finally get my answer. I mean, I forgot Arrow was even on this week, what with all the arbitrary breaks The CW takes, I assumed it wouldn’t air if The Flash didn’t air and–look at me getting off topic again. POINT IS, someone major died. POINT IS, I’m not all that sad about it. Remember back forever ago when I predicted who might be in the grave? Well, let’s do a hard and fast recap, shall we? And the answer is…..can I get a drum roll, please? I’ll be honest, I didn’t think they’d actually kill her. And maybe, given that this IS Season 4 Arrow and not Season 2 Arrow, she may still yet live. 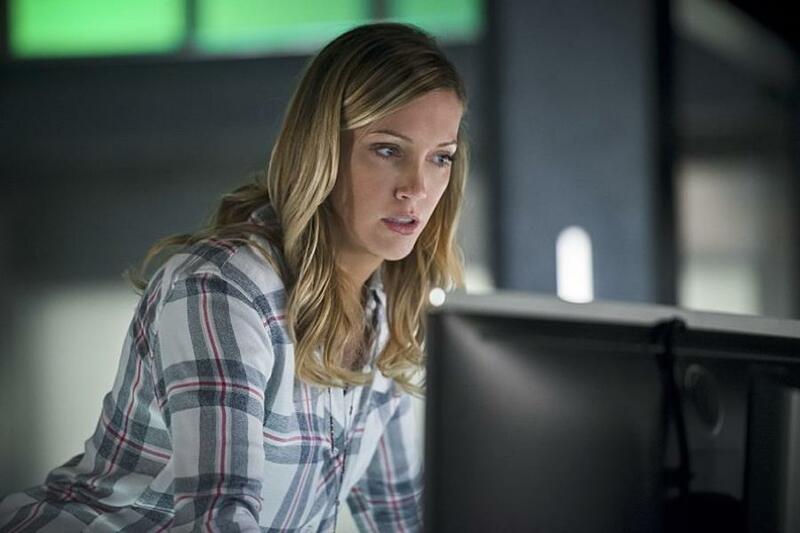 Maybe there’s some plot where Ollie helped to “fake” her death to keep her safe from Darhk or maybe Sarah, angry from all that time travel, will come back and dump her in some newly found Lazarus Pit 2.0, but the POINT IS, as of 11:59 in Arrow time, Laurel Lance is dead. I’ll probably be the last one to mourn Laurel’s death. She’s never been my favorite character on the show, always whiny and WAH OLIVER CHEATED ON ME WAH, but I could put up with her because I knew she had a purpose as Black Canary and Black Canary is a pretty prominent, and awesome, DC character. It was my hope she’d grow into that at least for younger generations, a mentor like she is in Young Justice. That being said, Arrow never really knew how to use Laurel’s character and her death in last night’s episode proved just that. When it came time to writing her role, they had a few options: A. Do they make her a superhero in Black Canary? B. Do they give her back her real job as an attorney? (And the only member of Team Arrow who actually works?) Or C. Do they shove her back into the box of women who love Oliver Queen more than anyone else in the world and then sacrifice her to spurn the Arrow into kickass mode? If you chose answer C, you are correct. That’s the problem with Arrow right now, ESPECIALLY when it comes to the female characters, and it’s exactly why I rooted so hard against Olicity as a couple. In the most recent season, everyone in the show is defined, almost exclusively by their direct relationship to Oliver. 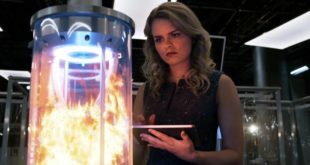 Felicity isn’t an IT guru anymore, she’s Oliver’s ex-fiance (and with their romance she lost all sense of self in the writer’s eyes). Laurel was the ex-lover Oliver always regretted cheating on. Thea is simply Oliver’s baby sister (and occasionally Merlyn’s daughter when the plot deems it necessary to remind us). 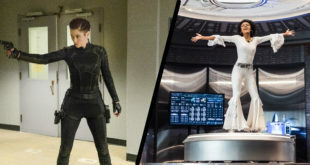 Outside of their immediate connection to the main character, these side characters have nothing, no sense of an outside life, so when they start getting a lot of screen time like Laurel has been getting the past three weeks, you start to feel like the writers are pulling a fast one on you, trying to make you feel emotions when the curtain finally drops. Granted, all of the actors involved did a fantastic job. 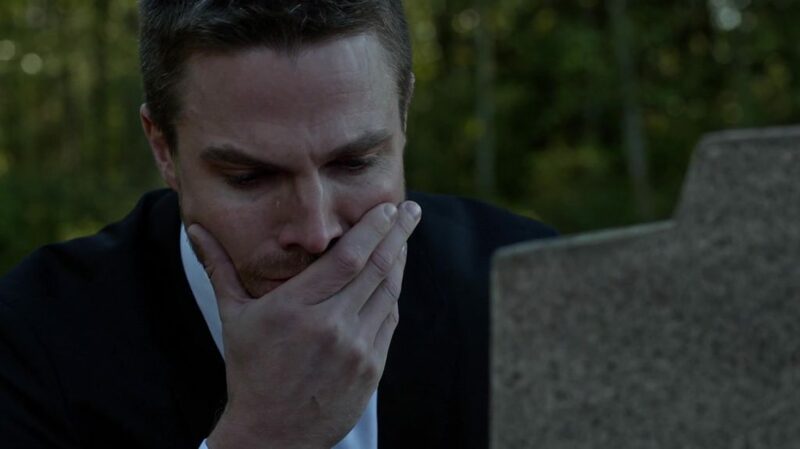 Stephen Amell really pulled at my heart strings and Paul Blackthorne collapsing in the hallway did a number on my tear ducts, but that doesn’t excuse the fact that the entire death felt like a tease. He promised a death at the beginning of the year that they didn’t have a plan for it so they went with the one that had the most “pop.” Do you know who uses a phrase like “most pop?” Web design clients who don’t know what the heck they are looking for in a design but will “know it when they see it.” That’s exactly what happened here. The Arrow crew slapped together a story, completely negating character development (like the relationships with Diggle, Andy, and Oliver) and used it manipulate our emotions to see which would get the best reaction. I know he said they’re “sticking” to their choice, but there’s a part here that feels a bit like a cop out. I know this is a comic book world where they play fast and loose with the rules of reality, but Arrow has always been a bit more grounded than the other shows; that was the appeal when it first aired. To have them say, “Oh but she’ll be back in some capacity but maybe just on another show,” cheapens not only the loss of that character, but the emotional intensity of the writing behind it. Laurel deserves better, y’all. She deserves to be known as more than just the girl who loved Oliver even when he treated her like crap. I’m not sad because Laurel died. I’m sad because of the life she never got to live on Arrow. Arrow airs Wednesdays on The CW at 8pm EST.